T3 helped judge theUK part of the annual James Dyson Awardfor students, celebrating innovation in design and engineering. Yep, I schlepped along to the brand's London HQ and helped sift through the dozens of UK entrants, assisting a Dame and Cambridge professor with a specialisation in combustion, and the guy who invented the fold-up plug. True story. Now, the results for the international competition are in. The winner, scooping £30,000 for the winning student team and £5,000 for their university (Waterloo, Canada) is theVoltera V-One printed circuit board (PCB) printer. 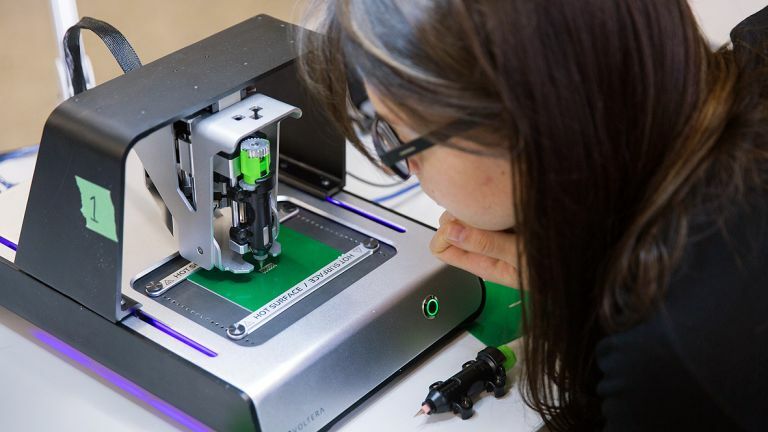 This enables inventors and engineers to create microelectronic parts, that would previously have had to be ordered and created off-site, in minutes. The device, about the size of a laptop, 3D prints the PCBs, including conductive and insulating inks, to create functional, two-layer boards. It also includes a 550W heater and solder paste dispenser, so components can be added straight to the board. Voltera V-One, the project ofJesús Zozaya (25), Alroy Ameida (25), James Pickard (24) and Katarina Ilic (24),has already raised $502,000 since launching on kickstarter in early 2015, withthe machines planned to ship to customers by the end of this year. Also highly commended wereGreen Fairy, byWei-Lun Huang, of Taiwan's Chung Hua University. These resemble dim sum and containbiodegradable cell beadshoding 'specially bred microorganisms' which prevent poisonous algal bloom in water, by consuming 'human excrement, fertiliser, animal manure, pesticides and detergent.' Mmm-mm. Finally, Express Dive byCathal Redmond of the University of Limerick, Ireland, aims to democratise and simplify diving byvastly reducing the weight and size of the breathing apparatus, and reducing the cost to €400. It combines the convenience of snorkels with the greater depths available to Scuba divers, with a one-litre air tank that can be refilled at the push of a button.